Companhia Siderúrgica Nacional (CSN) is one of the most important, integrated and competitive companies in the world regarding iron ore and flat steel production. Isatis software played an important role in the audit process in CSN. Casa de Pedra Mine, which belongs to CSN, accounts for all its iron ore supply, producing natural pellet ore, sinter feed and fines with high iron content and great physical properties. 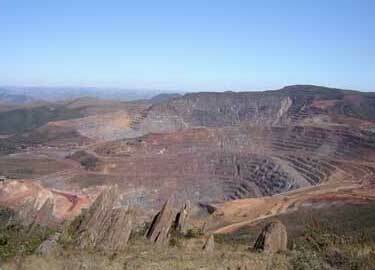 The mineral reserves at Casa de Pedra Mine are incredibly vast and it is rated as a world class mine. The reserves were audited by Golder Associates S.A. in 2006 and a new record in proven and probable reserve was achieved, when the amount of 1.631 billion tons of iron ore was confirmed. The results were reported to the United States Securities and Exchange Commission (SEC). Business Development Department was in charge of preparing the data for the audit. This Department encompasses Long Term Planning, Business Development, Quality Control and Mineral Process. Speed of implementation and capacity of processing complexes algorithms and sophisticated and precise models. The main challenge was to implement the software in a very strict deadline so that the whole process would be ready to be audited. It was a 6-month period of training, eventually leading to the successful achievement of proper and consistent results. The granulometric fractions and the SiO2 accumulations within these fractions were co-estimated using Cokriging and then used to calculate the SiO2 grades for each fraction. The SiO2 Cokriging domains were defined separating the former Hematite Geogroup into two: soft and compact hematite. The definition of these co-estimation domains was validated by univariate and multivariate statistics within these zones. Cross-variograms were obtained by zone and lithotype and were modeled in Isatis using the automatic fitting option to ensure that the models were adequate for co-estimation. The data restrictions were applied as follows: a minimum of 3 samples to estimate a block; octant restrictions were applied; a maximum of 24 samples to estimate a block. The variable silica accumulation in the Pellet Feed (AcSiF45) was included in the co-estimation, amongst others. The results were analyzed and anomalous values were checked. The silica grade within the size fraction was finally calculated using the co-estimated values. Golder carried out a full analysis of all available information and has used checks and experience to independently validate that the reserves reported are available for mining. According to Golder, the Cokriging estimation process and results have been reviewed and checked for consistency. The procedure is well documented. Golder considers that the co-estimation method was repeatable and the parameters used were reasonable. The new ore reserve represents a significant increase when compared to the last audit report prepared in 2003. Casa de Pedra reserves are sufficient for production of about 50 million tons per year and give CSN the opportunity to develop a new age in its mining business. Integration of planning processes for three areas: Long Term Planning, Short Term Planning and Quality and Process.